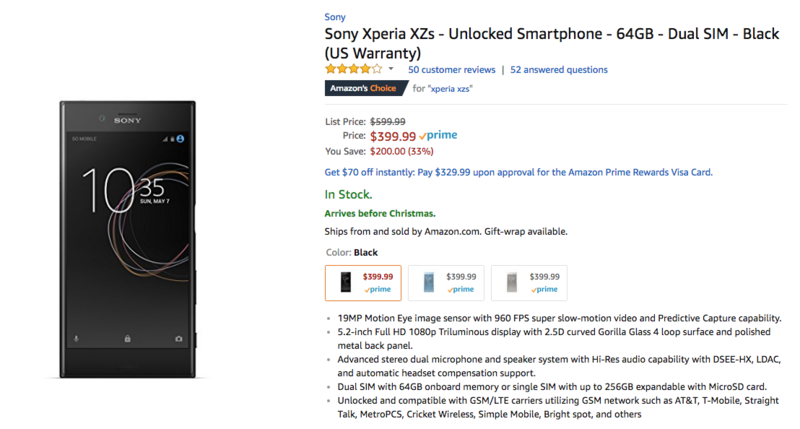 The XZs actually started off at $699, receiving a $100 MSRP price drop not long after. It sports a 5.2" 1080p display, a Snapdragon 820, 4GB of RAM, 64GB of storage, a 19MP 'Motion Eye' camera that can shoot 960fps video, a 13MP front-facing camera, and a 2900mAh battery. It's also IP68 water-resistant and can take two SIMs at a time. Three colors are available: Black, Ice Blue, and Warm Silver. Amazon seems to be the only retailer offering this discount, but all three colors are available at this low price. Shipping is free, as it usually is, and Amazon estimates that it'll get to your door before Christmas. Hit the links below to grab one of your own.